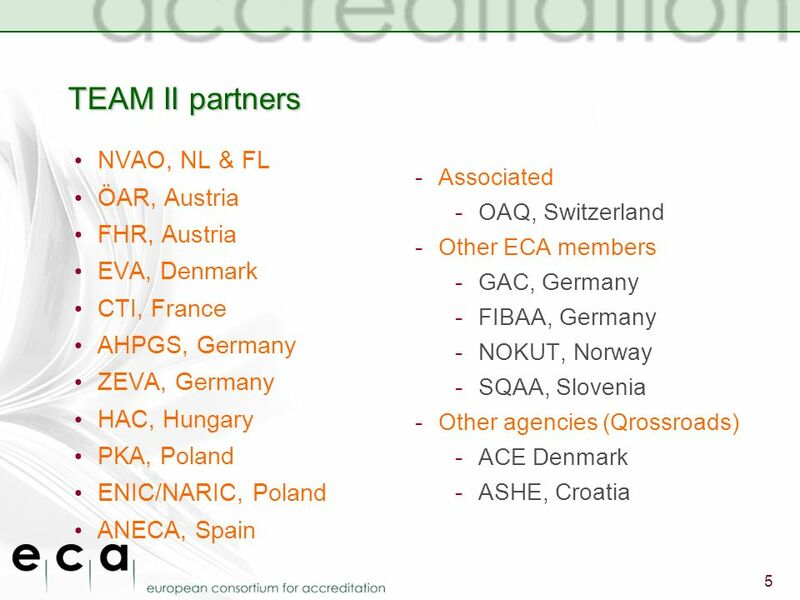 Introduction to the TEAM II project Introduction to the TEAM II project Karl Dittrich Chairman of NVAO and Vice-Chair of ECA Thursday 10 June 2010, Graz. 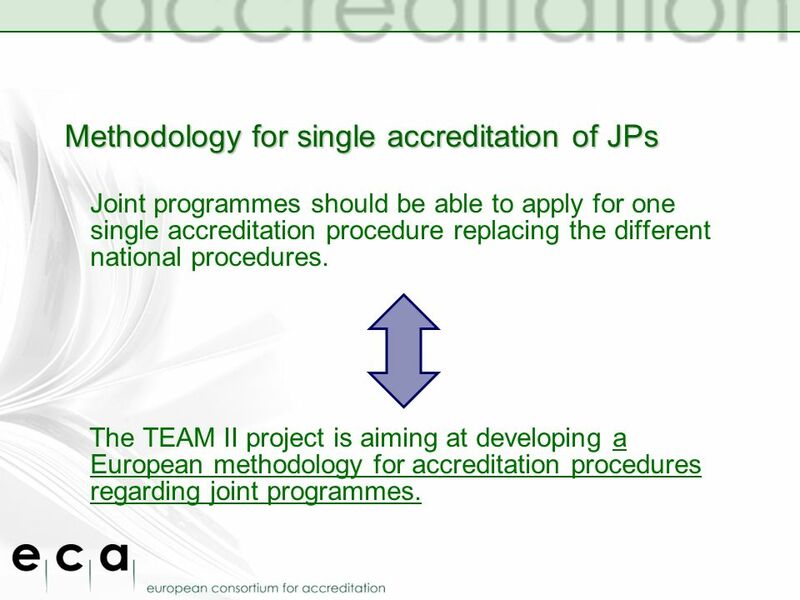 12 Methodology for single accreditation of JPs Joint programmes should be able to apply for one single accreditation procedure replacing the different national procedures. 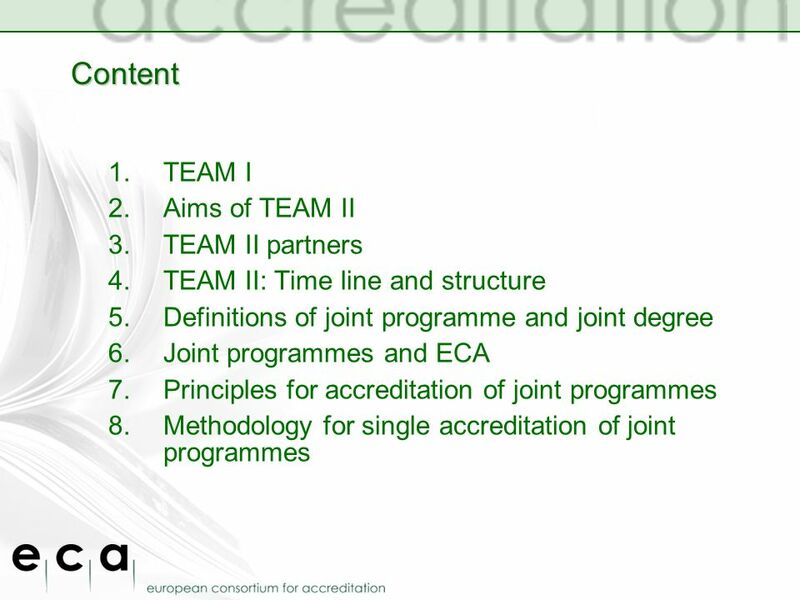 The TEAM II project is aiming at developing a European methodology for accreditation procedures regarding joint programmes. 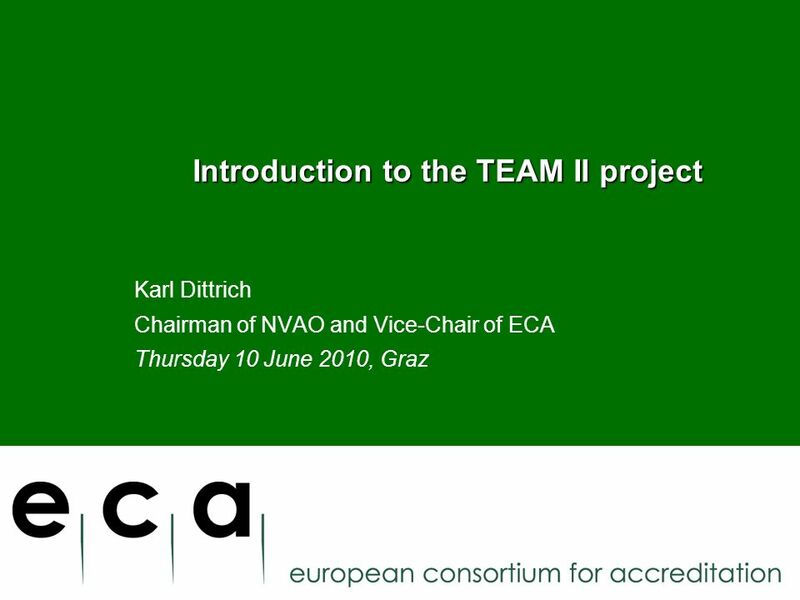 Download ppt "Introduction to the TEAM II project Introduction to the TEAM II project Karl Dittrich Chairman of NVAO and Vice-Chair of ECA Thursday 10 June 2010, Graz." 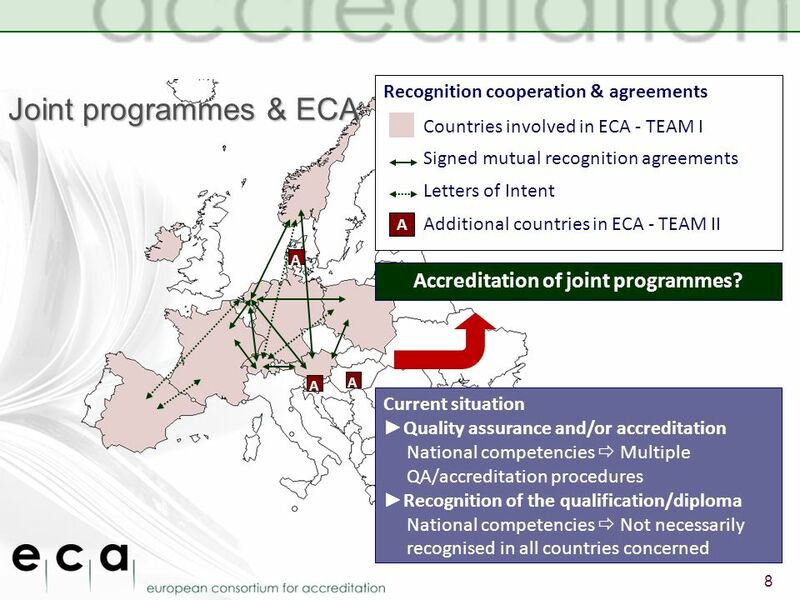 Welcome cordially 12th ECA Workshop Zürich, Switzerland 2009. 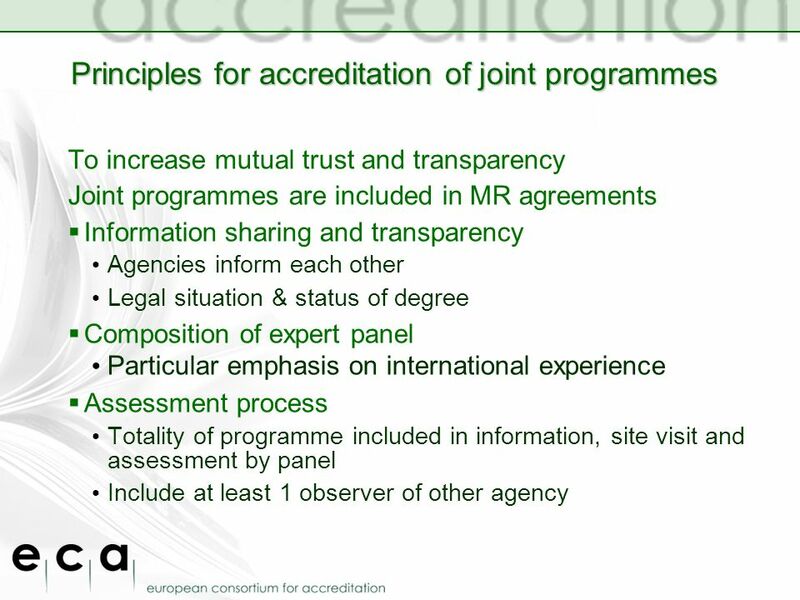 ECA WORKSHOP- OUTCOMES PARIS 2006 WG 1: DRAFT AGREEMENT TOWARDS MR; DISCUSSION OF OBSERVATION REPORTS AND OTHER INFORMATIONS WG 2: JOINT PROGRAMMES ARE. 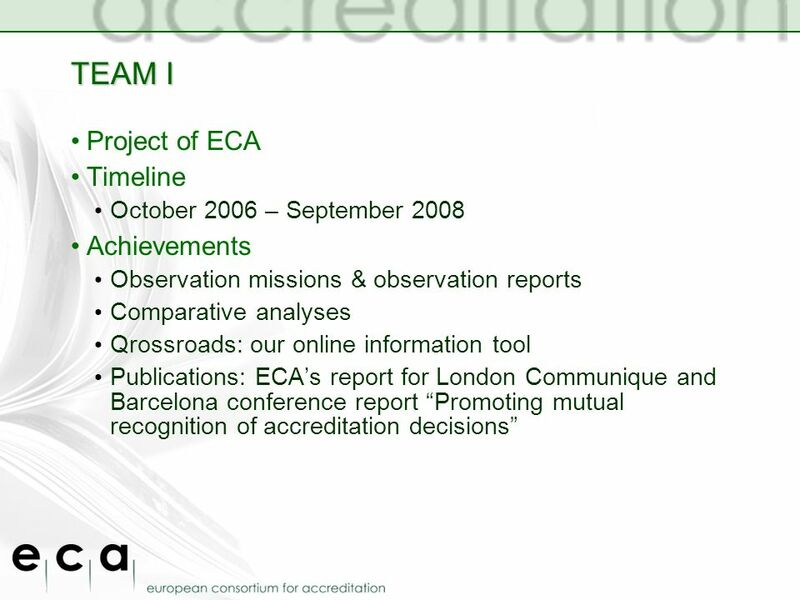 ECAs TEAM PROJECT by Axel Aerden & Mark Frederiks. 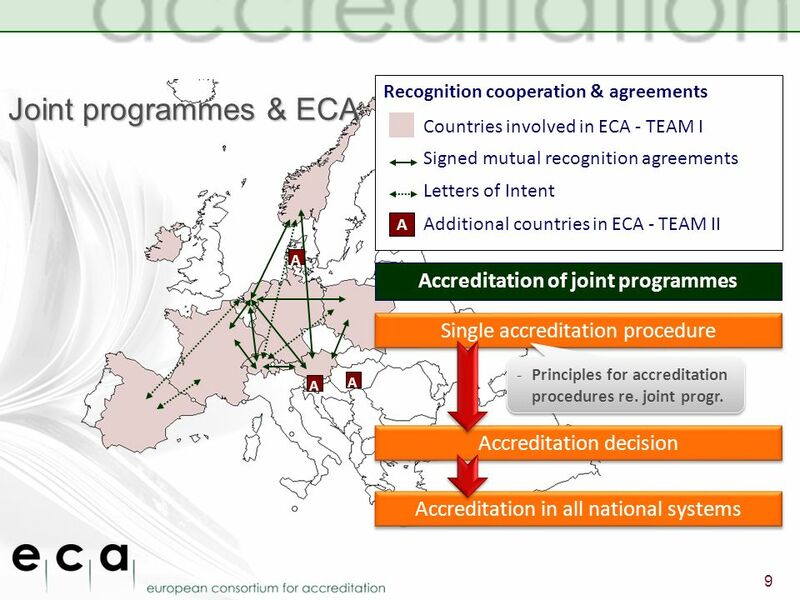 ECA working group 1: Mutual recognition PARIS, 6 December 2006 Europe in Transition: ACCEPTING & RESPECTING Marianne Cox NARIC/ENIC THE NETHERLANDS. 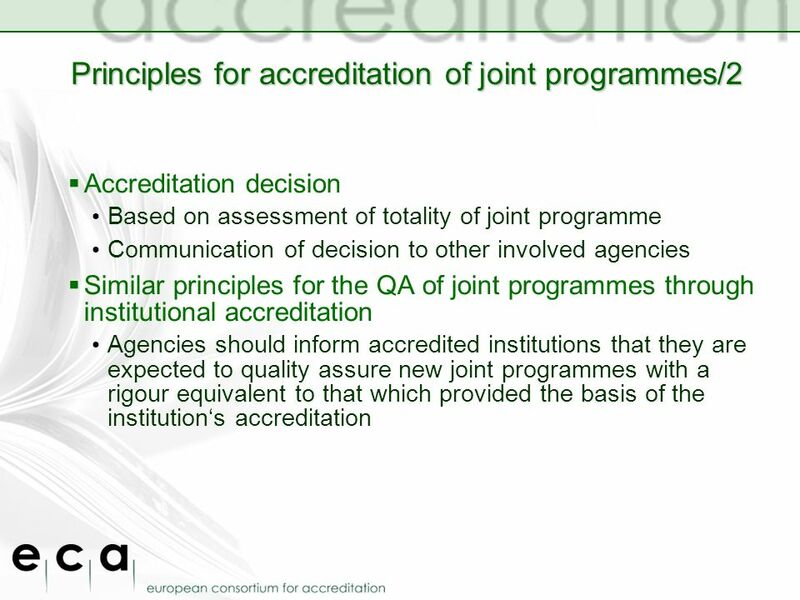 Current practicies in the recognition of qualifications awarded by joint programmes Hanna Reczulska Graz, 11 June 2010. JOINT DEGREES The Experience of the ENIC and NARIC Networks Dr. E. Stephen Hunt Manager, USNEI and President, ENIC Network ECA Team II Conference Joint. TEAM II An introduction to the pilot projects Thursday 10 June 2010, Graz Kaja Braathen- NVAO. 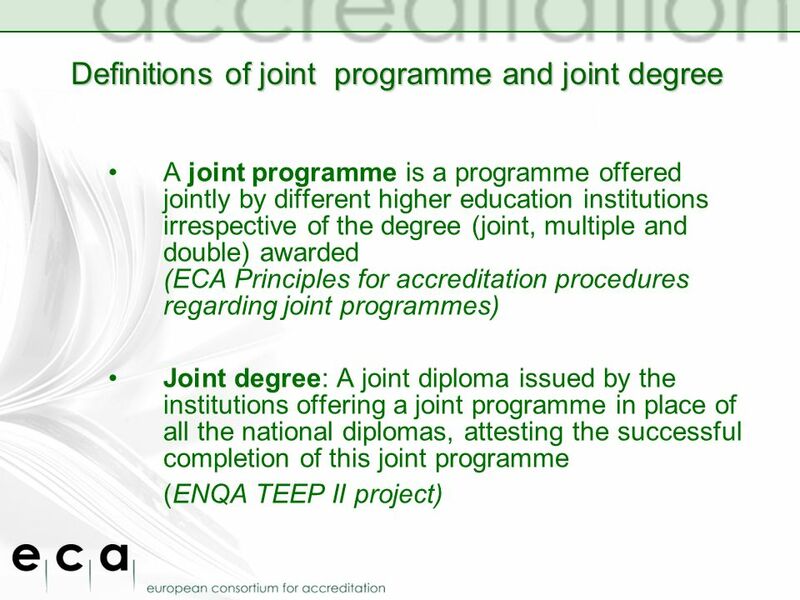 The Challenges of Joint Programmes The View of the Universities Tia Loukkola 10 June, 2010. ECA Conference Graz 2010 Joint Programmes - Recommendations Rolf Heusser, Chairman of ECA Graz, 10 June 2010. 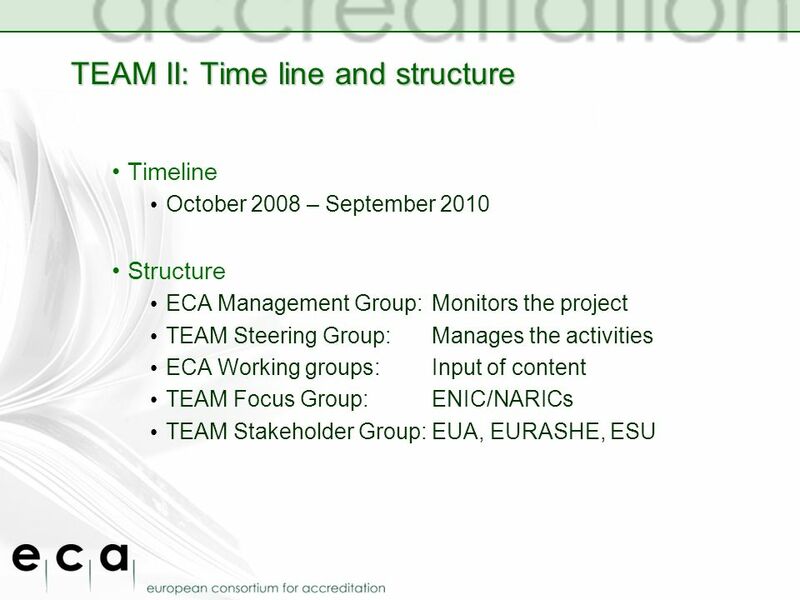 10 June 2010 Christina Rozsnyai1 TEAM II: Master CoDe WS 3: Joint European Master in Comparative Local Development Master CoDe Project METHODOLOGY ECA/TEAM. ENIC/NARICs Workshop Concluding remarks Rolf Heusser, Chairman of ECA Warsaw, 26 March 2010. ECA Conference Graz 2010 Joint programmes Rolf Heusser, Chairman of ECA Graz, 10 June 2010. TEAM II European Teacher Education for Primary Schools (ETEPS) Workshop in Graz 10 June 2010. ENIC-NARICs Workshop Introduction Rolf Heusser, Chairman of ECA Warsaw, 25 March 2010. 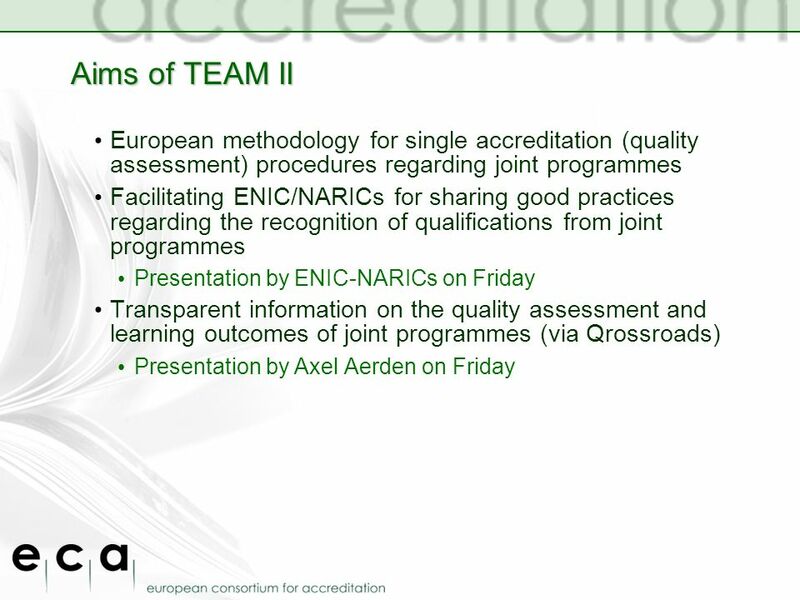 THE RECOGNITION OF QUALIFICATIONS AWARDED BY JOINT PROGRAMMES EUROPEAN CONSORTIUM FOR ACCREDITATION (ECA) ENIC-NARICs WORKSHOP WARSAW 26 MARCH 2010. Joint degrees in Flanders Seminar Joint Degrees 6-7 May 2004 in Stockholm Erwin Malfroy NARIC-Vlaanderen.